April 21, 2017, Paramus, NJ — On Saturday April 8, 2017 Armenia Fund USA and members of Pure Earth took time to visit the Kirikian Armenian Saturday School of the St. Thomas Armenian Church in Tenafly, New Jersey. The visit was to bring awareness and to educate the children, grades kindergarten through 7th, about Armenia Fund USA’s Toxic Pollution Cleanup Project in Akhtala, Armenia. The soil surrounding the Armenian Apostolic Church monastery in Akhtala, Armenia will be cleaned up within the Toxic Pollution Cleanup Project. Currently, approximately 500 local children are at risk of lead poisoning, which can lead to mental disabilities and developmental delays, decreased bone and muscle growth, damage to the nervous system, kidneys and hearing. 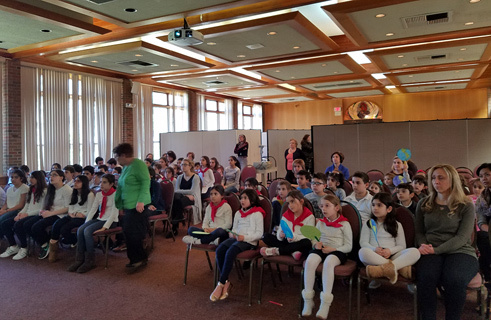 Every year, the Kirikian Armenian School celebrates Earth Day with a special project. The school picks a different cause every year to learn about, support and donate towards. The purpose of the Earth Day project is to teach the children the importance of “giving”. The Earth Day Project program started 8 years ago by Jacklyn Baltaian, who is in charge of the Arts and Crafts Department for the school. “Since I am personally a nature lover and involve myself in doing the best I can for the environment, I wanted to share that awareness and consciousness with our school as well as to translate Earth Day as a special day for the Kirikian Armenian School students to get them to think about our culture and national needs in general,” states Mrs, Baltaian. 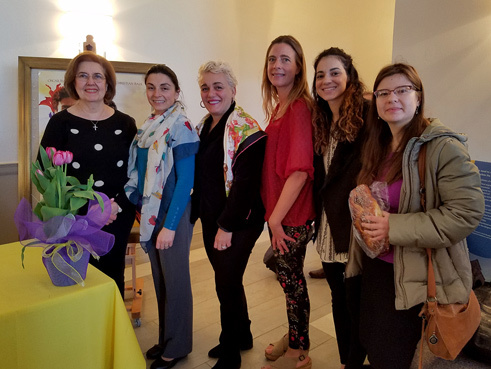 Mrs. Baltaian and Mrs. Capan, Principle of the Kirikian Armenian School, invited Armenia Fund USA and Pure Earth to give a speech about the dangers of toxic pollutions and what they are doing to lessen that danger in Armenia. Taking part in the presentation were about 75 students, ages 5 to 14. After the presentation, students’ hands shot up asking their questions and concerns about their peers in Armenia. The day ended with all the kids excited to be able to help. Each student received a backpack with information about the project as well as a donation envelope to be able to support the project if they wished to. Realizing the importance of educating Armenian youth here in the United States about the environmental issues in Armenia threatening the well-being of local population, Armenia Fund USA took pride in being a part of this year’s Earth day celebration within the Kirikian Armenian School.